Now, I haven’t even looked at that query so I don’t know who’s ranking, and that’s on purpose because I don’t want to call anyone out. 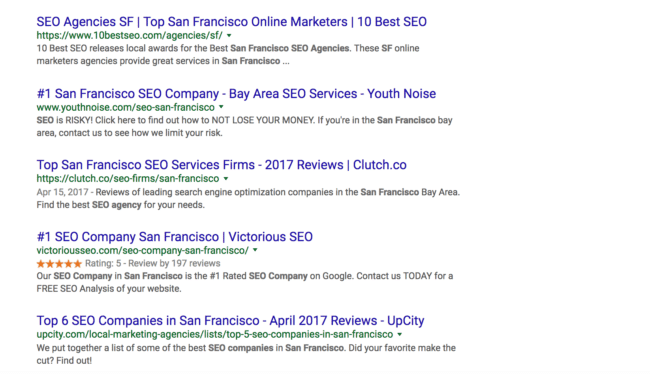 Here’s an example of another city so you can see what a typical (seo agency + city) search results page (SERP) looks like. In this SERP, you deal with four ads (aka paid placements) then a map and three local “organic” listings and finally the regular organic two scrolls below the fold. Your first challenge is going to be even getting down to the organic listings, which are where an SEO’s true colors even show. The ads at the top, of course, are paid. They’re on a bidding system and the person with a high bid, a good quality score, and a combination of other factors (I’m no PPC specialist, mind you) are most likely to be there. So are they good at SEO? Who knows. They’re willing to pay to get your click though. To be clear, I have nothing against advertising. Credo is, to an extent, an advertising platform for consultants and agencies to get more work. But that is different from search ads in that there isn’t “Credo ads” and also agencies/consultants cannot/do not pay extra to be ranked better on Credo. Search ads don’t mean the agency is any good at SEO. We need to dig deeper. 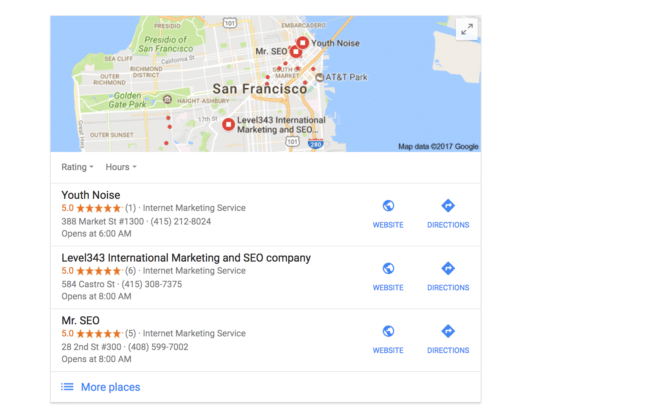 When a local map and a few organic listings within the map appears in a search result, that of course means that the query you entered is being seen as a local query. That works great for services like plumbers and hardware stores, but internet-based services like SEO or PPC? I understand why location can matter when it comes to internet-based services like SEO, to be sure. Sometimes you need someone to come to your office and meet with you. I’d argue, though, that these instances are the exception, not the rule. The amazing thing about the internet in its current state is that you are able to communicate with anyone anytime and anywhere in the world. I can be in Mexico (just an hour different from my regular time zone of Denver) and it’s no different for my clients who are in San Francisco. So while it might be useful to know who is in your city, what’s more useful to know is what time zone an agency or consultant operates from. Most businesses looking to hire someone on a consulting basis prefer for the person or agency to be within three hours of the business’s time zone. Other than that, location shouldn’t really matter for SEO, since what works in Minneapolis for local search will work in Denver, and vice versa. Work with the right agency/consultant and don’t let location restrain you. Now we get down to the real fun – should you trust someone who ranks #1 for an SEO-related term in a specific city? If you have SEO knowledge, you can probably dig in enough to know why they are ranking. You can look at their site targeting and their links to see why they rank. 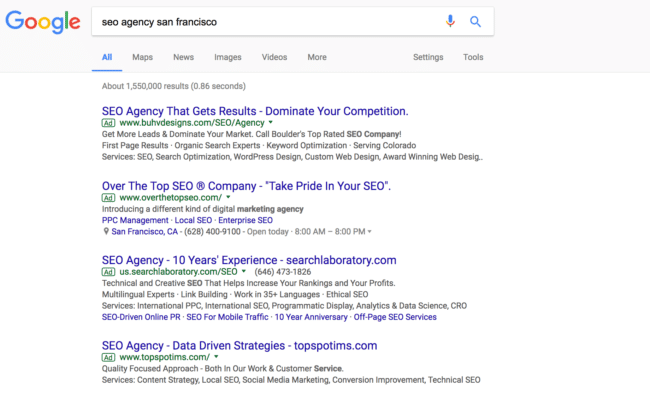 I picked one site from the [San Francisco SEO agency] query, because it’s an individual agency that I have never heard of. I’ve been in the industry a long time and know most agencies in the major cities. Does this work for rankings? Yes, short term. But will it hurt them long term? Almost definitely unless they diversify their link profile and build a brand to last long term. It’s pretty easy to rank short term, but if you are trying to build a sustainable business it’s going to take longer. SEO comes down to risks. Of course in business you want to play to win, but at some point the risks you could take to expedite things and make them go faster just aren’t worth it. Moving into an office so that your team can work together in person, or building a remote-only culture purposefully. Hiring someone to do something for you when you don’t have any idea how you should measure their success. Don’t play with fire when you’ve never seen fire before. Alright, so what’s the moral of this story? First off, be suspicious of any SEO company saying that they can guarantee you first page rankings. Second, see if you can figure out why they are ranking. Or, if you speak with them ask them how they got those rankings. If they can’t explain it to you, move on. Third, ask to speak with some of their clients who are happy with their work. If they won’t or can’t, walk away. Finally, if you need it then get a second or third opinion on them from someone in the industry. If no one has heard of them before, probably best to walk away. If you can’t find the people who supposedly run said agency online, then definitely walk away. These things matter, as do reviews on third party platforms (though of course, look closely at those and see if they are legit). To finish off, should you hire the person or agency who ranks highly for SEO-related terms? Talk to others in the industry. Sadly, in my location, I see many SEOs from other cities and states filling the top of the rankings for [city name] SEO and/or [state} SEO in my area. Many of their sites are simple templates that they reproduce and strategically rank between to help boost their rankings. Other spammy tactics are easy to see as well – fake reviews for local SEO, fake/shared addresses to secure a location in a city, etc. Most of the results are so awful that I’m not sure that I want to show up there, even though I’m a dedicated SEO marketer. I’ve been torn about even attempting to rank for those type of keywords. I’d rather play the long game for myself and my agency and earn top ten organic search rankings for SEO terms.